Google has me a little discouraged with their simple “We will no longer support” attitude. Just when you find a program or app that works for a particular application, it becomes obsolete, unsupported or discontinued. The fate of Google Buzz, Google Picasa (its coming) and now Google Calendar Sync. I have used Google Calendar Sync for years to sync my Android phone to Outlook which I use on my laptop. It just worked. New calendar entries in either location automatically appeared on the other calendar. Now, with Google’s announcement earlier this month, I needed to find a solution ASAP. After doing some research, there appears to be 6 options (7 if you include signing up for a $5 monthly subscription to Google Apps for Business). Here are the options, in descending order of preference based on my research. 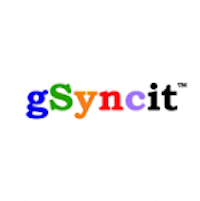 gSyncit | Fieldston Software, $19.95 single License. gSyncit is a Microsoft Outlook add-in that allows for the synchronization of Outlook calendars, contacts, notes, and tasks with your Google account. In addition, gSyncit also supports synchronization between Outlook and Toodledo, Pocket Informant Online, Evernote, Dropbox, Simplenote and Nozbe. Sync2 | 4 Team Corporation, $59.95 single license. Share and sync Outlook Calendar, Contacts and Tasks folders with Google services. Ogg Sync | OggSync, $29.95 single license. Outlook 2003, 2007, 2010, 2013 Support. Full 2 Way Sync with Google Calendar. You will need to purchase and install the correct version of OggSync depending upon your Outlook Version (2003, 2007, 2010 or 2013. Outlook4Gmail | Scand Ltd, $19.95 single license. Although this is free technology, I am a little leary of using a product that has not been updated on over two years. Support also seems limited. After reviewing all of the options out there, I purchased and installed gSyncit. There is a discount for multiple licenses, so the two that I needed cost me $32. The install was simple. What gSyncit does is create a Microsoft add-on with a tool bar button so synchronization can easily be configured while in Outlook. I was up and running in little over 5 minutes. I also synced my Outlook and Gmail contact lists, which I had never done before – This was really nice. gSyncit also offers lot’s of sync options, including setting the timing on sync intervals. This service has indeed come to an end. Extremely annoying that Google keeps screwing us over like this with several of their services. Iv also tried some freeware,but as you said its rarely updated or their service is very limited. CompanionLink is a good option but its damn expensive. Heard of GSyncIt but haven’t tried. What I ended up using from last August was EVO Collaborator for Outlook, a little plug-in for Outlook. Modestly priced as well. Thanks for the information Marcel. I will check EVO Collaborator out. I am currently using GSyncit, however, there are constant updates and after each update the frequently used email address (Outlook type ahead) require learning all over again. AS I have continued to use, I find that my “recently” used contacts never pop up in Outlook 2007 when I start typing a name. This is a little frustrating. gSyncit is also updating the software a little too frequently. Seems there is an available update about every week. Just a few thoughts. I have not had an opportunity to speak with any of gSync’s customer service. You can use Calendar Sync +. It is an open source utility, completely free. More features are being added with every release. You can also make suggestions to include a feature. Future plan includes contact and task sync. Beware of EVO. It’s a Chinese company disguised as a Taiwan entity to look half respectable. “Marcel”s real name’ is Ben Wang who works for EVO and who writes that blog that supposedly shows how great the product is. I made the mistake of buying their crap and in addition to not working and being buggy, good luck getting any support. Support emails are NEVER answered. There’s NO INFORMATION on their website. After I peeled about 3 layers to find out that EVO is “owned” by Prosperwave CO., LTD. which is listed in Taiwan but is owned by Hung Chao Technology Limited which is owned by http://www.ckmmold.com.tw/ which is based in China. I don’t mind buying my underwear from China but software is a different story. China may know how to hack and steal software but not how to create quality dependable code. I lost $29.50 which is not a big deal but it’s your call where you want to put your money and what kind of service you think you deserve. Anyway that’s my story and that of 100s on a forum I frequent. I’ve tried Sync2 and gSync and their biggest problems were lack of proper support and using Google cloud for syncing. I don’t mind using public cloud, but I want to decide myself whether I want my sensitive data going through it. I don’t understand why they don’t provide any alternative syncing methods when asking some money for their software. While searching for another solution I faced a few posts about EVO Collaborator plugin. Thank God and John Collet from the previous post that I didn’t give them a chance. Things are much better with Akruto and Companionlink where there are options for people like me who don’t like cloud. As for support, it took two days to get reply from Companionlink while Akruto contacted me in an hour. I stayed with Akruto because it works with native calendar app of my Galaxy S7. However, my experience with Akruto wasn’t 100% great. Yes, it works great without duplicating Calendar events and syncing over Wi-Fi really takes only 3-5 minutes to set up, but syncing your Outlook calendar with Android device over the Internet is not that easy. I’m not a tech-savvy person so I had to contact support to configure my Wi-Fi network properly. Thank God they are fast.